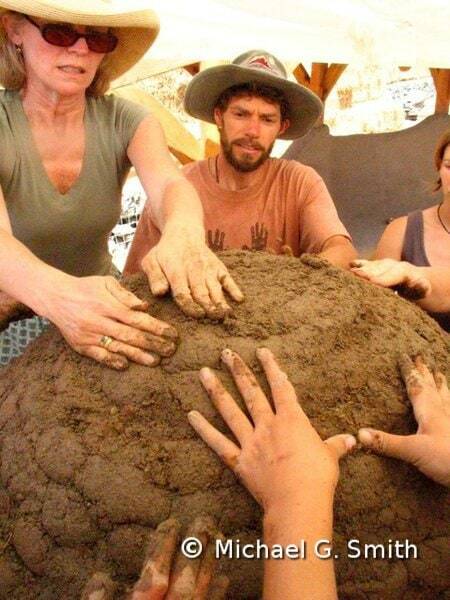 I have taught at least 120 hands-on natural building workshops, ranging from day-long earth oven workshops for kids to 12-week professional trainings. Most of my workshops are about a week long, usually covering several different natural building techniques on an actual construction project. Don’t forget to look at my currently scheduled workshops and sign up for updates. If you are planning a natural building, you might consider hosting a workshop on your site. Workshops are a good way to get a large number of helping hands involved in your project while creating an opportunity for others to learn along with you. My workshops are always tailored to the specific needs and opportunities provided by the project; I have taught all of the systems listed here. I usually spend about 2/3 of class time on hands-on building and about 1/3 on demonstrations, lectures, discussions and tours. I charge a per-day teaching fee, plus travel time and expenses and on-site prep time. Sometimes the tuition paid by students more than covers the cost of the workshop and can help subsidize your building costs; but don’t count on it unless you have substantial experience with organizing, promoting and filling workshops. If you don’t want all the administrative and logistical responsibility of a public workshop, I can also help run a work party for your friends and family, or an on-the-job training for you and your building crew.